This Hong Kong Valentine’s, Ellermann have a selection of exclusive bouquets on offer, including stunning arrangements delivered in stylish trinket boxes or glass jars for a touch of rustic romance. 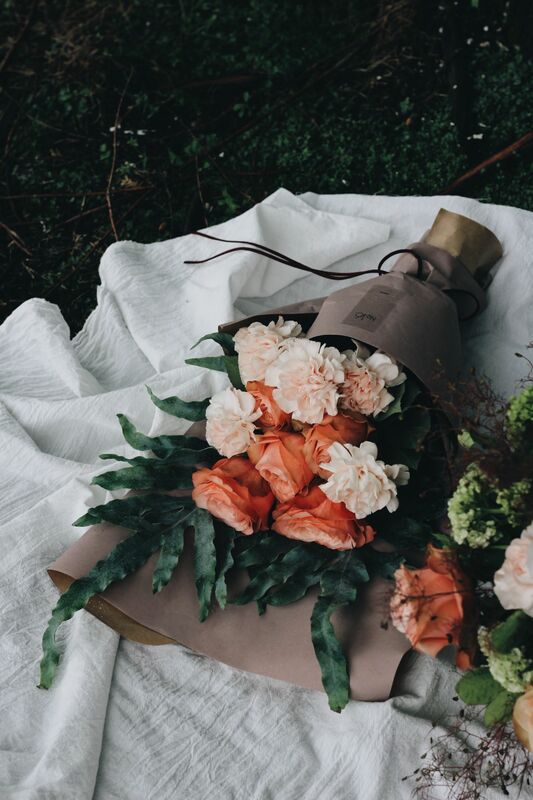 Founded by Aussie friends Jessi Chloe Chen and Aria Chau, ANDRSN is a bespoke florist specialising in boxes of fresh-cut Australian roses. Choose from boxes of 36 or 64 roses in shades of fuschia, scarlet, cream and yellow, all of which can be personalised with two lines your choice of text. Just in time for Valentine's Day, ANDRSN have launched The Wonderland Collection inspired by Alice in Wonderland. The whimsical selection offers four designs that have been delicately arranged in checkered lattice—a perfect gift for the queen of your heart. With locations at ifc mall and Times Square, Flannel Flowers has been creating luxury bespoke floral arrangements since 1994 for special occasions, weddings, events and corporate clients. Their Valentine’s bouquets (which you can watch get assembled on their website) include the classic Darcy with roses in shades of pink and red, and the Giverny with softer shades of lilac, pink and green. They also have a special collaboration with Diptyque, featuring two boxed rose sets with a limited edition Diptyque candle placed in the centre. Kenny Chan started his floral business in 1985 providing European-styled flowers, and his company Greenfingers now has two convenient locations in Central and Tsim Sha Tsui. This year, their Hong Kong Valentine’s collection includes the otherworldly Love Tree made from pink roses to more elaborate bouquets of peonies, hydrangea and the extravagant HK$6,800 mega-bouquet of premium red roses. Comma Blooms is well-known for their floral subscriptions but they also do one-time deliveries too. For something different from the usual Valentine's bouquet, why not a succulent pot, floral basket, or vase arrangement? Options abound at Flower Delivery Hong Kong, which offers an impressive variety of flowers and bouquets—think a rainbow of lilies, tulips, roses, sunflowers and orchids. For Valentine's Day, romantic arrangements of all colours and sizes—including heart-shaped boxes filled with roses—are available along with a selection of sweet extras like Lindt chocolates, teddy bears and even a personalised charicature of you and your significant other.